Papaver atlanticum 'Flore Pleno' is one of the first poppies to bloom in late spring, and what a cheerful sight! The double flowers are a soft shade of orange that doesn't clash with other colors. Papaver atlanticum blooms the first year from seed. It looks charming in the wildflower garden or cottage garden. Also known as Moroccan Poppy. Hardy in zones 4-9. Papaver is a genus with annual, biennial and perennial flowers in a wide range of colors. 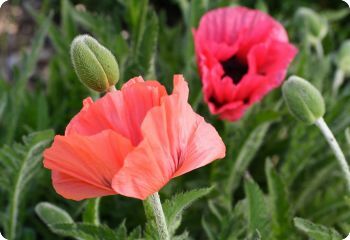 This page features our perennial poppy seeds. 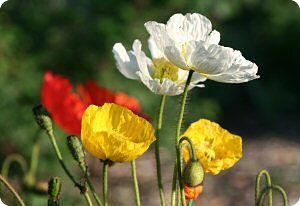 Start perennial poppy seeds indoors 8 weeks before the last frost date. Sow on the surface. Full sun. Papaver nudicaule is a biennial or short-lived perennial. The tall-stemmed flowers bloom in yellow, orange and white with the occasional pink. The brightly colored flowers are a welcome sight in late spring. Also known as Arctic Poppy. It often reseeds on bare soil. Seeds can be started indoors or direct sown in early spring. Deer resistant. Hardy in zones 3-9. These oriental poppy seeds came from two different poppies in my garden that make a beautiful combination. One has watermelon-pink flowers, and the other has deep apricot-pink flowers. Of course, they may have crossed in the garden, so there could other shades in between. Papaver orientale blooms in early summer. The large flowers look wonderful with bearded iris and Hesperis matronalis Alba. Hardy in zones 3-9. 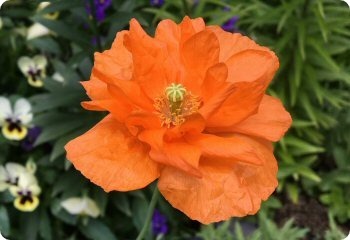 If you are a gardener who is afraid of the color orange, then you haven't tried Poppy 'Double Tangerine Gem'. The soft orange color is so nice that you'll want to call it "soft tangerine". Papaver rupifragum 'Double Tangerine Gem' is similar to Papaver atlanticum 'Flore Pleno'. They both bloom the first year from seed, but Papaver rupifragum is more compact. Also known as Spanish Poppy. Hardy perennial in zones 5-9.